BOSTON - Wednesday, November 1, 2017 - Mayor Martin J. Walsh today joined residents at a ribbon cutting to celebrate the implementation of the City of Boston's first Neighborhood Slow Streets zone in the Stonybrook section of Jamaica Plain. Neighborhood Slow Streets is a priority project of Go Boston 2030, the City of Boston's long-term transportation plan. The program meets three important goals of the plan: to expand access for all modes of travel by making Boston's neighborhoods more interconnected; to improve safety by substantially reducing collisions through reallocating street space to prioritize moving people safely; and to ensure reliability by prioritizing predictable travel on Boston's transit and roadway networks. The Neighborhood Slow Streets Program also supports Boston's Vision Zero goal of eliminating fatal and serious traffic crashes by 2030. Neighborhood Slow Streets was developed by the Boston Transportation Department and the Boston Public Works Department to reduce the number and severity of crashes on residential streets, lessen the impacts of cut-through traffic and add to the quality of life in the City's neighborhoods. "I'd like to thank Stonybrook residents and others who volunteered their time, ideas and effort, and worked side by side with the Boston Transportation Department throughout the planning and design stages of this project," said Mayor Martin J. Walsh. "This community-led process is a milestone for Boston, and I'm proud these projects will continue making our streets and communities even safer through innovative solutions." The Neighborhood Slow Streets Program is a zone-based approach to traffic-calming that reduces the speed limit in a neighborhood to 20 miles per hour (MPH) and self-enforces that speed limit through design. The Stonybrook community planning and design process has included multiple community meetings to refine the planning and design elements, and to reflect suggestions expressed by the community. Gateway treatments at each entrance to Stonybrook that identify the area as a neighborhood with a slower speed limit. "This is an active neighborhood, filled with families and residents who want to take advantage of our location near Franklin Park and Jamaica Pond," said Danielle Cerny, Stonybrook resident and neighborhood association steering committee member. "Walking or riding a bike, taking your kids to school, visiting a neighbor -- all of those should be pleasant experiences the neighborhood is built to encourage. But in the past, these types of activities could feel stressful and unsafe because of how many vehicles sped down our streets. With the implementation of this new program, we're looking forward to having safer and quieter roads, and to continuing to work with the City to learn from and expand this initial pilot." "Today's celebration is a culmination of the community engagement, planning and engineering process that was employed to create the Stonybrook Neighborhood Slow Streets Program, and it illustrates that we are well on our way toward achieving the goals and targets established by Go Boston 2030," said Boston Transportation Commissioner Gina N. Fiandaca. 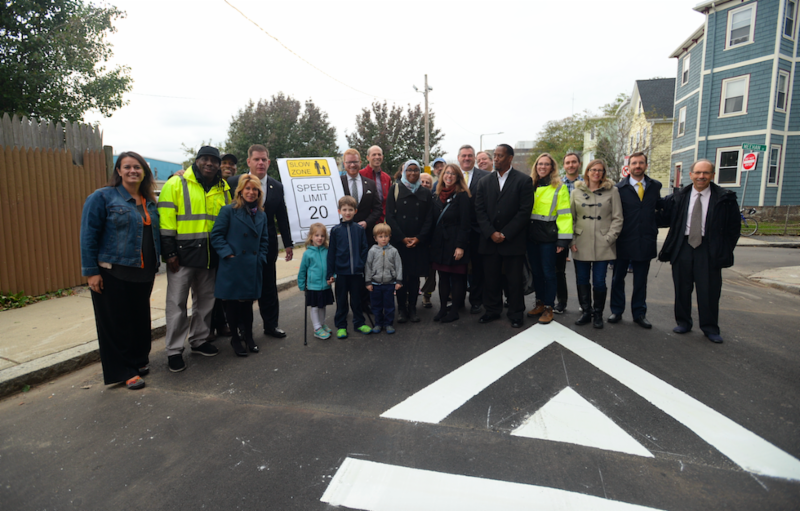 "Along with Stonybrook, the Talbot Norfolk Triangle neighborhood of Dorchester is another Neighborhood Slow Streets pilot area, and we are happy to report that construction to implement that project began today. Data was collected in these two neighborhoods during the planning process and will be collected again next year to understand the effectiveness of the built plans." "Consistent with Go Boston 2030, over $709 million will be invested over the next five years to implement safer streets, more reliable and predictable transportation, and improved transportation access for residents," said Chris Osgood, Boston's Chief of Streets. "During the annual budget process this year, Mayor Walsh committed to increasing the Vision Zero investment by $1 million in fiscal year 2018 to a total of $4.1 million, with the $1 million increase dedicated solely to the Neighborhood Slow Streets Program. This has allowed planning to begin in five new residential areas this fall while construction has been taking place simultaneously in the two pilot neighborhoods." "It has been a pleasure to work with residents of Stonybrook and Talbot Norfolk Triangle designing Neighborhood Slow Streets programs for their neighborhoods, and we were excited to have the opportunity to spend time recently walking neighborhood streets with residents of the five new neighborhoods," said Boston Transportation Department Active Transportation Director Stefanie Seskin. The five new Neighborhood Slow Streets programs were selected from 47 applications that BTD received from communities across the City. Each proposed area went through a comprehensive scoring process. Objective criteria included the number of households with youth under 18, the percentage of the population aged 65 or older, the number of crashes per mile within the area, and the presence of parks, libraries, and public transit. The five applications selected to be the next communities to receive traffic calming treatments as part of the Neighborhood Slow Streets program were among the top-scoring in the evaluation process. The planning, design and community process for the five new neighborhoods will be completed in late 2018 with implementation to follow. Detailed scores associated with the evaluation of each of the 47 applications is available online. BTD will be accepting applications in 2018 from communities interested in participating in the next series of Neighborhood Slow Streets programming.